Below is a form with which you can contact us for any further information, please remember to include your arrival and depoarture dates and the number of guests. PLEASE NOTE: occasionally, some email systems mistakenly identify webform replies and block them, if no answer has been received reasonably quickly then please also check your 'spam' or 'junk' folder. Please contact us again if necessary and we will email you directly from an alternative source. WE DO ANSWER ALL EMAILS. If you wish to provide securing details online using a credit or debit card, please click here to go to our secure form. Details on the form after 'billing address' are optional and serve only as a double check of details if you wish to do so. Please see our terms and conditions on our Policy page for further details, in particular note that a payment is only ever taken in advance where you have specifically agreed this (for example Hogmanay first night deposit, or group booking deposit). 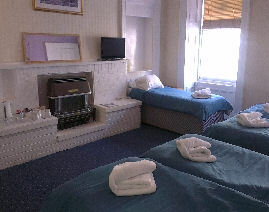 The Group/Family Room at The Valentine City Centre Guesthouse; a range of rooms are available for one to six people.